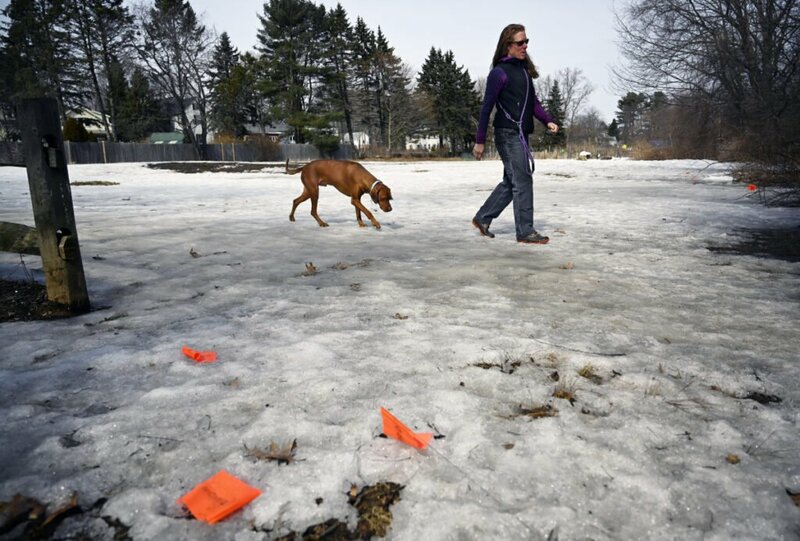 As snow turns to mud, a park ranger runs out of flags – orange, not quite red – highlighting the volume of dog feces at one of the city's most popular dog-walking spots. 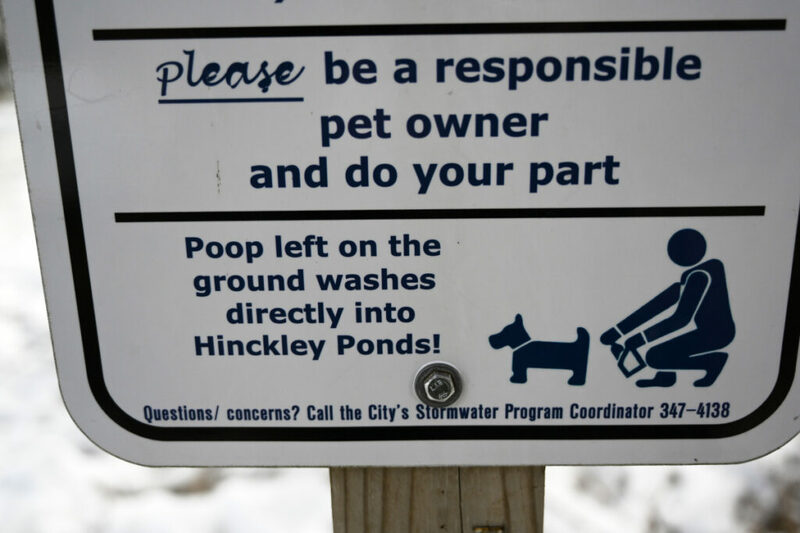 SOUTH PORTLAND — The prevalence of dog poop in Hinckley Park has prompted city officials to take bolder action because polite signs and gentle prodding have fallen short. 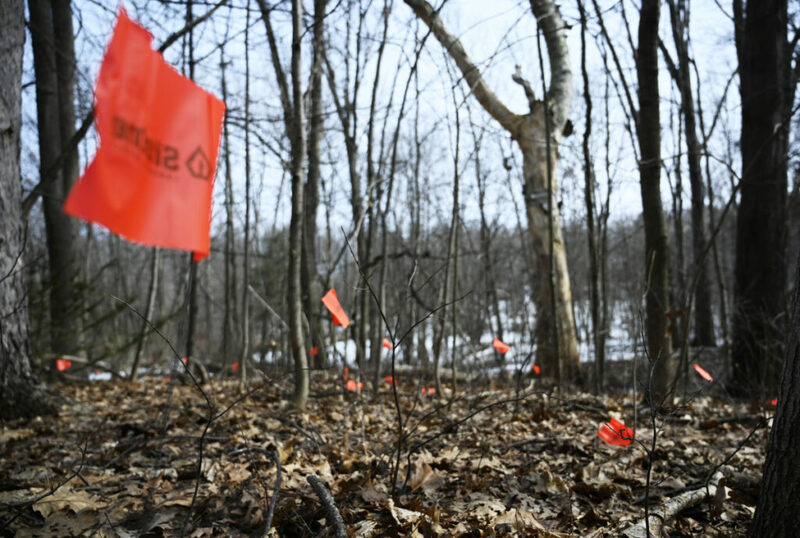 Park Ranger April Bolstridge planted 300 small orange flags wherever she saw dog feces in the melting snow and mud in one of the city’s most popular open spaces. She started near the main entrance off Highland Avenue and ran out of flags about 300 yards into the 40-acre park. Bolstridge said she decided to try a new approach because talking about the problem with park visitors hasn’t diminished the number of little land mines. Moreover, she was aware that “April Stools Day,” a community effort to clean rubbish and dog waste from parks, is fast approaching and will soon reveal several months of hidden feces. She placed the flags Wednesday, knowing that a major rainstorm is expected Friday. “I wanted to get in there before the rain melts all the snow because it’s much harder to tell (the poop) apart from the mud,” Bolstridge said. Bolstridge got the idea from a fellow park ranger in Colorado, where flagging feces had succeeded in raising public awareness. Beyond the obvious aesthetic drawbacks of such a large concentration of dog waste, it poses a serious environmental hazard to water resources in the park, including Hinckley Pond and Old Ice Pond, and a health threat to all park users, especially children, she said. The feces buildup at Hinckley Park seems to surpass other popular dog-walking areas in the city, such as Bug Light Park or Mill Creek Park, likely because it’s wooded and feels more remote. One sign pleads, “Please be a responsible pet owner and do you part.” Another sign gently warns visitors to “clean up after your dog,” and notes Chapter 3, Section 3-28 of city ordinances. Technically, however, the municipal law bans dog owners from even letting their pets poop on public property. It’s illegal “to place, deposit, or permit to be deposited any dog excrement” on any street, park, beach or storm drain in the city. Violators may be fined $100 for a first offense, $250 for a second offense and $500 for each subsequent offense. Bolstridge said some people who saw her placing the flags asked why she wasn’t picking up the waste. She said the city doesn’t have the resources to pay municipal staff to pick up dog feces day after day. Heather Hodgkins said she’s glad the parks department is making a bit of a stink about the dog waste problem. The South Portland resident was at Hinckley Park on Thursday evening with Finnigan, her 7-year-old golden doodle. A bag dispenser near the entrance to the park was empty Thursday evening.